C.O. Bigelow Mentha Lip Shine – Hall of Fame Worthy? Pros – smells amazing and the mint inside doesn’t irritate lips. Cons – love it but have too many balms in my life. My skin is sure killing me these days because it’s so dry this time of year. I have a humidifier on every night and that won’t visibly help my skin, especially on my legs but C.O. 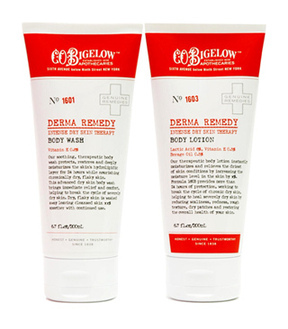 BIGELOW Derma Remedy Intense Dry Skin Therapy Both Lotion ($18/6.7oz) will. This hypoallergenic concoction is for really dry, chapped and overall bummed out skin and claims to provide a moisture barrier for more than 24-hours. The C.O. BIGELOW Peach Nut Oil Liquid Soap ($15 @ bigelowchemists.com) is an 18-in-1 soap not just for the shower. The formula doesn’t give a lot of lather and you have to use quite a bit to cleanser but that's not a problem since the bottle is a big 7.5oz. And the scent? A really light hint of peach that isn’t overpowering or un-natural smelling. Here’s the interesting part - Not only can it be used for both the body and hair, but other parts as well. As in, other parts of the house! Straight from the label on the bottle, and I quote, “laundry, floor cleaning (floor cleaning?? ), jewelry cleaning, stovetops, car washing, boat washing, and the strangest one, surf board washing. Now when anyone tries to tell me about a great all-in-one? I’ll just mention this one and case closed.